When you talk to Econorod be assured that you are dealing with one of the leading drain cleaning services nationally. 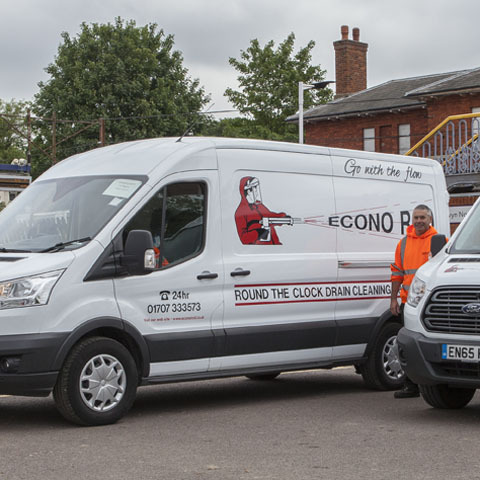 Econorod provide a range of specialist drain cleaning services to the commercial and private sector, ranging from High Pressure Water Jetting, Electro-mechanical cleaning to Pipe and Sewer Re-lining. Econorod now has an extensive network of clients across london and the South East. Should you be looking to change from your present drainage contractor Econorod are happy to arrange a free consultation to discuss your sites individual requirements. We're there when you need us most. Whatever the situation you can count on a rapid response from Econorod. Our priority is ensuring minimal disruption to your commercial operations. Our preventative drain maintenance keeps drains in good stead for the future and offers protection against flooding. We recommend our maintenance service as an essential service to any business where blocked drains and flooding could cause disruption to normal business services. Find out more. Click here to send us an enquiry online.